@mars, the Panasonic MSX2+ doing E in Turbo mode. If that was still in 60Hz, then it is a speed record. But it smells like the E of 50Hz machines. When naming the machines, you should always mention the VDP hz, only then the spec is complete. So, the first number has quite some variation and thus not very reliable as an emulator benchmark, at least. The 2nd number also has some variation, but it's a lot more stable. The other numbers only vary a tiny bit (1 in my runs). So they should be reliable. hit9918 : I use always the Auto Mode for the VDP frequency, so it was still 60 Hz, and I was even surprised by the result. Btw, if you try 50 Hz on a Panasonic MSX2+, you get F in normal mode and you 'crash' immediately in turbo mode, without even reaching A !!! (or TV can tell it is 60Hz) and you hit the E, then you got a winner. a crash? how does the crash look like? no red paint? hit9918 : I think it needs to be checked on a real machine to be sure that something is not missing in the emulator. The code is so primitive, I got no idea in which way it would crash. 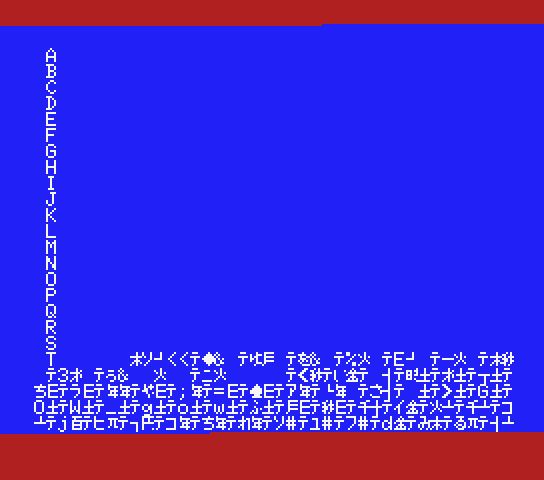 The letters on the low side is where a copy to vram starts. With otir. On MSX1 there probably would be trashy wobbeling because of going too fast. But normaly trash can happen only in vram contents, not on the cpu side. p.s. mhm it is in screen 0, there MSX1 can take the speed, too.